Shuttle has introduced its new high-end PC barebones designed for gamers and enthusiast who are not afraid of overclocking. The new XPC SZ270R9 features the R9 chassis that can accommodate a modern desktop graphics card, several 3.5” hard drives and even has a programmable RGB lighting. One of the important features of the newcomer is the “Turbo” button on the front panel that loads overclocking configuration when users need it. The Shuttle XPC SZ270R9 is based on a custom motherboard featuring Intel’s Z270 PCH and compatible with Intel’s 6th and 7th generation Core i3/i5/i7 processors (Skylake, Kaby Lake). The mainboard has four DDR4 DIMM slots and supports up to 64 GB of DDR4-2133/2400 memory, a PCIe x16 slot for video cards, a PCIe x4 slot for other add-in-boards (for example, an ultra-high-end SSD, or a 10 GbE NIC), two M.2-2280 PCIe slots for NVMe SSDs as well as one M.2-2230 slot for an optional 802.11ac Wi-Fi + Bluetooth module. The motherboard also carries two Intel i211 GbE controllers, Realtek’s ALC662 5.1-channel audio codec with appropriate headers, four SATA connectors, USB 2.0/3.0 Type-A ports, an HDMI and two DisplayPort outputs for iGPU. The R9 chassis was architected with enthusiasts in mind: it is relatively small, but it can house rather powerful hardware. First off, it features a proprietary ICE 2 cooling system with four heat pipes that takes away heat from the processor to a rather huge heatsink. The system supports overclocking of CPUs with unlocked multiplier, but judging by the press release, it makes no sense to expect the SZ270R9 to offer sophisticated overclocking capabilities found on premium motherboards that can help to squeeze every last bit of performance out of a CPU. What is important is that the SZ270R9 has a special ‘Turbo’ button that loads overclocking settings when they are needed, thus reducing strain on system components that "permanent" overclocking might cause. Next up is expandability. The R9 chassis can house graphics cards that are up to 280 mm long (and based on a picture by Shuttle, they can be rather tall too) as well as four 3.5” storage devices (there are 3.5” to 2×2.5” brackets included in some regions). With two high-end M.2 SSDs and four contemporary 3.5" hard drives, the SZ270R9 can easily store 50 TB of data, assuming that two 1 TB SSDs and four 12 TB HDDs are used. Meanwhile, since the system is based on the Z270 PCH, the Core i7-7700 K CPU will be the highest-performing processor supported by the SZ270R9. Another constraint is the lack of any USB Type-C headers on the system, which might become a problem several years down the road. Dimensions Length 332 mm | 13.07"
Width 216 mm | 8.5"
Height 198 mm | 7.8"
Shuttle Computer may be considered the father of today’s small form-factor gaming PCs as the company pioneered them in the early 2000s, when gaming desktops were bulky and barely had any style. This decade, the company faced rather tough competition and had to refocus on specialized PCs and barebones. 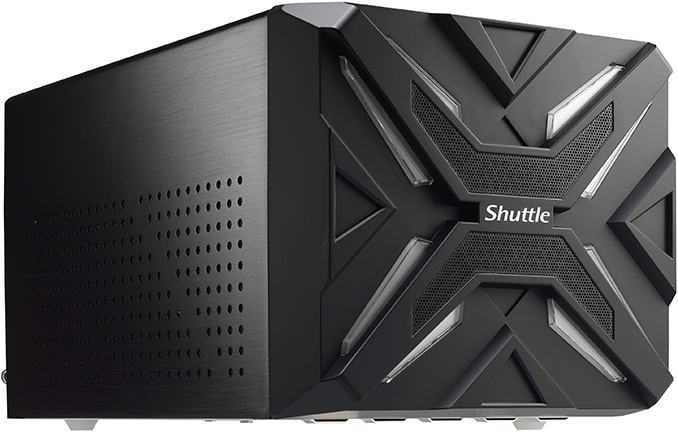 For several years Shuttle was nearly absent from the market of PC barebones for gamers, but this year it is making a comeback. So far, the company released two ultra-compact SFF gaming systems (1, 2) and the XPC SZ270R8, which is a close relative of the SZ270R9. The launch of the XPC SZ270R9 with RGB and one-touch overclocking is a move towards a higher end market segment. What remains to be seen is whether Shuttle goes for the ultra-high-end with something based on the Intel X299. Shuttle has not disclosed MSRP or ETA of its XPC SZ270R9. Since the new PC barebones is based on a proven platform and are already demonstrated in Japan, it is safe to say that the new unit will be released in several weeks, not months, from now. As for pricing, the SZ270R8 is now available for $449.99 from major retailers in the U.S., so expect the SZ270R9 that adds ‘on demand’ overclocking and programmable RGB lighting to be priced in the same ballpark. While yes its a bit late to release only support for the 7xxx and older. Depending on when the initial design for this was started it may have been to early for the 8xxx series. Crap... Really need and Edit button... To continue my thought..
"with the recent revelation that Coffee Lake IS compatible with 200/100 series motherboards"
I mean, I've honestly never been surprised that Intel had been forcing consumers to change chipsets and have been adding or removing a pin from the socket for a few years LGA1156, LGA1150, LGA1151, etc. They want people buying a brand new motherboard to go along with a brand new CPU, etc. Your screen name makes me smile so I wanted to let you know I love it! Apart from a different front panel and a tweaked drive bay, this thing is virtually identical to my Shuttle XPC SZ77R5, which came out 5 years ago. Even the motherboard layout looks identical, like they just took the same design and swapped out the chipset and socket. The basic Shuttle layout hasn't changed since donkeys years. I used to own quite a few of them - SB51, SB62, SZ series - the ICE cooling has had only minor changes. It's sad because Shuttle at one point in time was really an SFF pioneer, right now Intel and Corsair are WAY more innovative with their NUCs and Corsair ONEs. As an aficionado of small/tiny and quiet PCs, I've had a few Shuttle SFF boxes over the years, including 2 in current service (a G45 which runs XP for reference, and a Z170 box on my desk).